To evaluate the results of combined anterior cruciate ligament (ACL) and anterolateral ligament (ALL) reconstruction in patients with chronic ACL injury. It was hypothesized that patients who underwent combined ACL and ALL reconstruction would exhibit less residual laxity and better clinical outcomes. Two groups of patients were evaluated and compared retrospectively. Both groups consisted only of patients with chronic (more than 12 months) ACL injuries. Patients in group 1 underwent anatomical intra-articular reconstruction of the ACL and patients in group 2 underwent anatomic intra-articular ACL reconstruction combined with ALL reconstruction. 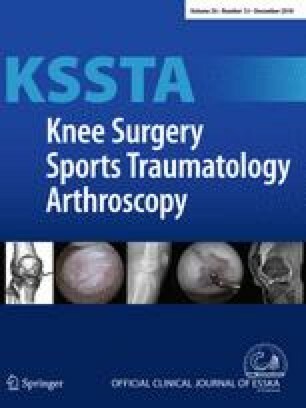 The presence of associated meniscal injury, the subjective International Knee Documentation Committee (IKDC) and Lysholm functional outcome scores in the postoperative period, KT-1000 evaluation, the presence of residual pivot shift and graft rupture rate were evaluated. One hundred and one patients who underwent reconstruction of chronic ACL injuries were evaluated. The median follow-up was 26 (24–29) months for group 1 and 25 (24–28) months for group 2. There were no significant differences between groups regarding gender, age, duration of injury until reconstruction, follow-up time or presence of associated meniscal injuries in the preoperative period. Regarding functional outcome scores, patients in group 2 presented better results on both the IKDC (p = 0.0013) and the Lysholm (p < 0.0001) evaluations. In addition, patients in group 2 had better KT-1000 evaluation (p = 0.048) and a lower pivot shift rate at physical examination, presenting only 9.1% positivity versus 35.3% in the isolated ACL reconstruction (p = 0.011). Regarding re-ruptures, group 1 presented 5 (7.3%) cases, and group 2 presented no cases. The combined ACL and ALL reconstruction in patients with chronic ACL injury is an effective and safety solution and leads to good functional outcomes with no increase in complication rate. The clinical relevance of this finding is the possibility to indicate this type of procedure when patients present with more than 12 months after injury for surgery. CPH—designed the study, analyzed the data and wrote the manuscript. DBC—designed the study, analyzed the data and wrote the manuscript. MFS—analyzed the data and wrote the manuscript. PNG—analyzed the data and wrote the manuscript. MBB—analyzed the data and wrote the manuscript. JRP—supervision of the study. GLC—manuscript review, and supervised the study. MKD—analyzed the data, and supervised the study. The authors report no conflict of interest in relation to this study. Ethical approval was obtained at University of São Paulo (number 2.472.968). Informed consent was obtained from all individual participants included.